Dr. Paglia has been in his practice over 30 years. He earned his undergraduate degree from St. John’s University in New York, NY and his medical degree from the University of Alberta, Edmonton, Alberta, Canada. Dr. Paglia completed his internship and residency programs as well as a fellowship program at the Bronx Veterans Administration Hospital. He is board certified in both internal medicine and pulmonary disease. Dr. Paglia is affiliated with Northern Westchester Hospital. He is a Fellow of the American College of Physicians and the College of Chest Physicians. Dr. Paglia is also a consultant in medicine to Pepsico. 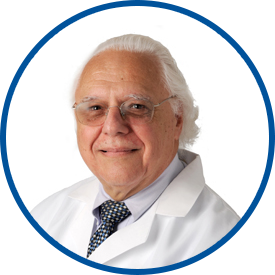 In private practice since 1968, Dr. Paglia joined Westmed in May 2001. *Dr. Paglia always cares and gives very good advice. *Dr. Paglia is incredibly patient, understanding, and thorough. He makes no judgments and is super kind. Dr. Paglia and his entire staff are the best around. This was an all around great experience as usual. Always very professional - great understanding of problems - real/genuine concern for my well being. Excellent physician - dedicated doctor. Dr Paglia puts me at ease each time I see him. I can see that he is concerned about my health concerns and really ponders about the treatment he will do and the medication he will prescribe. I'm very happy with him.